The NHL is locked out. This is the first full week when the owners and players are now in such disagreement that missing a portion of the NHL Season is very likely and the NHL is officially LOCKED OUT! We know the owners are in full agreement with the Commish Gary Bettman that the current state of their league can not move forward in the manner that it was. The problem now being faced though is the risk of missing a portion of the season. This has already happened to the NHL before and they actually missed a full season in 2005 and to be quite honest with you the NHL has reported that as few as only three teams turned true profit in recent seasons. The point being they do need to come to some sort of new agreement because the current way is not working. I personally believe it will be a short term lockout and its fallout should not be truly harmful, but the NHL should worry if it does become a long term problem. 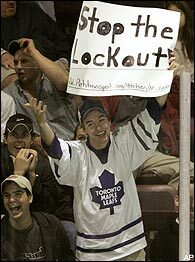 Today though we will delve into some of the other potential effects of the NHL lockout. When I spoke with some of the players and marketing people at the Columbus Blue Jackets they said the lockout will start to become a real concern if players begin to leave the league and play in Canada, Eastern Europe, overseas anywhere, etc. This happened to the NBA during the recent lockout but we saw little impact of big names players. The NHL will potentially lose bigger stars because some of the leagues in Canada and overseas are on a much higher pay scale and quality player level than the leagues that some of the NBA players had an opportunity to jump to. If good players leave the league and the problems are resolved and the lockout is ended you need to put a quality product out there. Let’s be very realistic here. The NHL is a huge corporation in America and it still is probably the 5th biggest professional sport in America (behind the NBA, NFL, MLB, and NASCAR) but it will not be able to return and bounce back from a long term lockout like the NBA and the NFL did. Let’s face facts: The NFL is America’s Great Pasttime now. (Sorry, MLB, it is not my call.) The NFL has some of the most loyal fans in the world and the second their lockout ended the fans were back. In fact, the fans were almost relieved and thankful for them coming to settle. The NBA has star power. They have the most marketable stars in the WORLD! Part of that is because they are not hidden behind helmets and pads but also part of that is the job the league has done. People may not have forgiven their team when the league ended its lockout but when LBJ, D Wade, Dwight Howard, Chris Paul, etc came to town they were getting their butts into those seats! The NHL I believe will have a very hostile fan base that will hold a longer term grudge against their league. Partly because it is not as popular as the other leagues and partly because it has happened them in 1994 and 2005. Yes we always think about the concession workers, the ticket takers, the sales people, that will lose their jobs as a result of the lockout. But you don’t always think about it as a whole for the city the team is located in. Here is a great article written by The Other Paper in Columbus Ohio on whether or not the downtown area can survive a long term lockout. Local business will suffer as a result of the lockout not just current employees of the arena and employees for the organizations. At the sports talk station I work at I have a client who owns two venues right next to Nationwide Arena where the CBJ play and part of the reason they have to pay such high rent, prime location, etc is because of the CBJ and the build in crowd their restaurant and bars are supposed to receive some 40 or so nights per year. I met with them the other day and if it is a long term lockout they have a very grim realization that times will be tough, they need to market and bring in a new crowd, and overall figure out a way to keep the lights on long enough for the lockout to be ended. Hotels, Airport Parking, Restaurants, Bars, TV Contracts, Sponsorship Sales, Janitorial Crews, the LIST GOES ON AND ON AND ON! There are 30 teams in the NHL and businesses like my clients in each market that will suffer. This will not help the economy either locally or nationally to get to where we want it to be next year. The players are poor compared to the owners. In a lockout the owners can hold foot for a much longer period of time. Starting this Sunday players will have to pay the going rate to use ice equipment, skate time, etc from their NHL teams in order to stay in shape. The NHL is not basketball where you can stay in shape by going to the park and running. The players aren’t going to be bankrupt from having to pay for all of this but it will make them very agitated and more bitter with their employer. Simply put it won’t improve player owner relationships. The list of possible long term and short term effects could go on for pages but the issue is simple: the NHL needs its players and owners to come to agreement as fast as possible or there will be a ripple effect throughout the entire league and the whole country and the road to economic recovery will not get any easier in this country or in Canada! What else do you feel or potential effects of the lockout? Leave your comments below or tweet us and tell us @sportsnetworker your thoughts. Thanks again for reading everyone! Rick Nash said today he may go play overseas and it could last all season…stay tuned! @clairezovko @sportsnetworker @sportslawchat thx for the RT! conceived. These include venlafaxine (Effexor) and mirtazapine (Remeron). a boy, or ten watermelons if she wants a girl.